This article is about the summon stone. 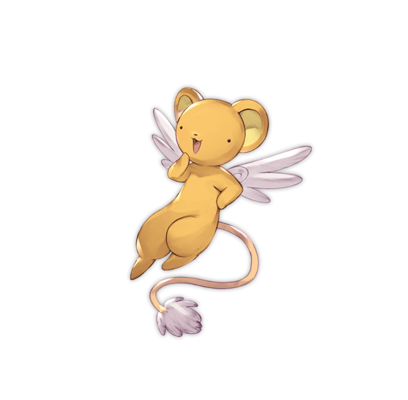 For the non-party character, see Kero-chan (NPC). Hey there! Hi there! Ho there! I'm the beast of the seal, Cerberus! As the keeper of the book of Clow Cards, I vow to protect them come wind or rain! Sakura awakened me, see? And she's always doing her best no matter the struggle. It's all thanks to her that I'm getting my magical powers back. That's why I can't let her or her friends down! So if you ever need me, just call! The beast of the seal, Cerberus, will always be there to lend you power! Aura - I'm the Creature of the Seal Cerberus! Call - Kero-chan to the Rescue! Dark Damage Cut.. 9T9 turn cooldown. Dark Damage Cut. when combo called. This page was last modified on 4 February 2019, at 21:59.